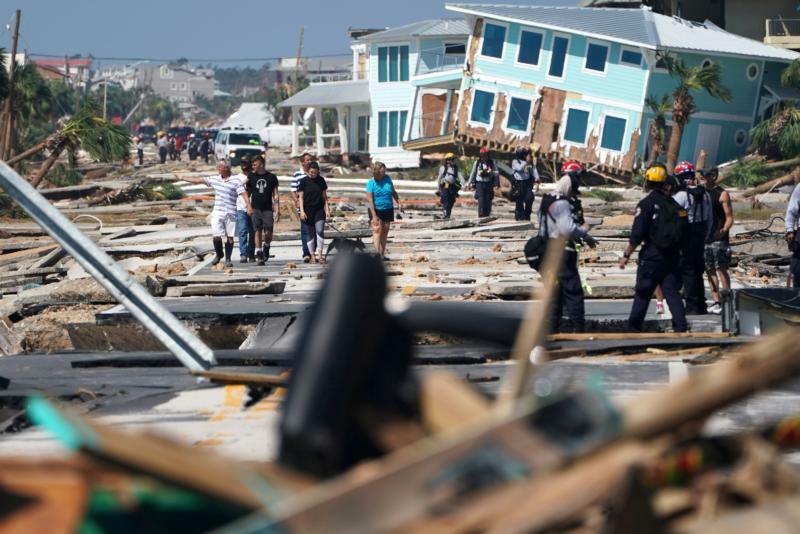 UPDATED – PENSACOLA, Fla. (CNS) — In the wake of Hurricane Michael, which ravaged the Florida panhandle, the Diocese of Pensacola-Tallahassee, whose territory was smack in the path of the Category 4 storm, has moved from prayer to action. The diocesan website still urged prayer for the hurricane’s victims, quoting two verses from Psalm 107, and also is encouraging people to donate much-needed items to those whose lives were upended by Michael. In conjunction with Catholic Charities of Northwest Florida, the diocese is accepting cash donations here. As of Oct. 15, civil authorities confirmed that 18 people had died but the death toll could go higher as at least 30 people were still missing. More than 250,000 people were still without power and could remains so for weeks. He said the priests and employees of the diocese have been accounted for and “personal injury seems to have been kept to a minimum given the size of the storm.” Some church buildings, parish halls, rectories, schools and other buildings may be a total loss, but the damage was still being assessed, he added. He asked those who are able to donate supplies or funds to help with the recovery. In the meantime, the bishop said, the diocese was working hard to arrange temporary places to celebrate the upcoming weekend Masses to accommodate parishioners whose church buildings are lost or have been deemed unsafe. “Obviously, if it is not safe — or possible — to attend Mass on a Sunday, you are not obligated to go. Your safety is most important,” Bishop Wack said. In separate statements Oct. 13, Cardinal Daniel N. Dinardo of Galveston Houston and Bishop Frank J. Dewane of Venice called for prayers for the victims of Hurricane Michael and for generosity in donations of food and material goods to assist those whose homes and livelihoods have been devastated by the storm. The cardinal is president of the U.S. Conference of Catholic bishops and Bishop Dewane is chairman of the USCCB domestic policy committee. “As the impact of Hurricane Michael becomes clearer, we will work closely with local dioceses, Catholic relief entities and with other organizations to assess the needs on the ground and offer assistance,” said Bishop Dewane. He also called on U.S. Catholics to pray for recovery efforts for “our brothers and sisters in Nicaragua, El Salvador, Honduras and Cuba,” also impacted by Michael. Like Pensacola-Tallahassee, early on the Diocese of Venice, well south of the storm, had posted a “Hurricane Prayer” on its diocesan website, which then migrated to Twitter and was retweeted.